Sin is the oldest negative thing on earth. After God created the world and the two people and called it all “very good”, sin came. Shortly after that came murder, lying, anger, jealousy, polygamy, and war. War has been with us for so long. I remember growing up, the Viet Nam War. It was the first war to be broadcast on television, and in living color, too. There were reports every single night. We’d hear the tally of dead and wounded. Scenes to my young eyes of limbless men hanging off gurneys in the jungle, helicopters, camouflaged men skulking with rifles pointed through the leafy undergrowth were plenty scary. They were scenes of chaos and blood. I saw a news article from the Canadian Broadcasting Company. 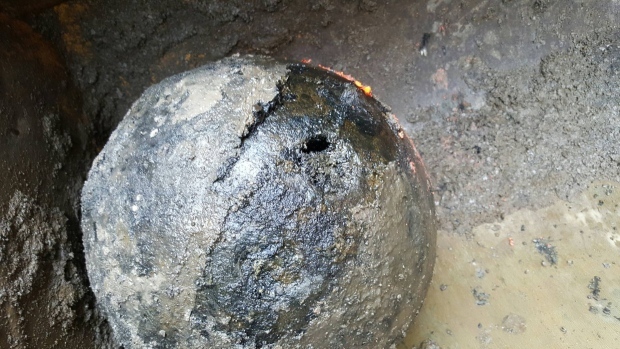 A cannonball fired by the British during the Battle of the Plains of Abraham in 1759 has been unearthed at a building site in Old Quebec. The rusted, 90-kilogram projectile was unearthed during excavation work last week at the corner of Hamel and Couillard streets and still contained a charge and gunpowder. The work crew that found the ball picked it up and gathered around it for photographs, unaware that it was still potentially explosive. Knowing that Tubal-can was in the line of ungodly descendants of Cain, and knowing the evil heart of man, I’d say with near certainty that some or all of those instruments were instruments of war. Many of those implements were likely arrows, shafts, spikes, and the sort. Then by Genesis 6:11 we read Now the earth was corrupt in God’s sight, and the earth was filled with violence. Violence that included war, with implements, I’m sure. “observations that strengthened his belief in Copernicus’ theory that Earth and all other planets revolve around the Sun. Most people in Galileo’s time believed that the Earth was the center of the universe and that the Sun and planets revolved around it.” (Source: NASA). But 20 years before that, Galileo experimented with, produced, and wrote about military technological advances, in a treatise called The Operations of the Geometrical and Military Compass. Galileo’s invention of the military compass was used to calculate precise trajectories of cannonballs and other military killing projectiles. Throughout the Renaissance many attempts were made to develop a universal instrument that could be used to perform arithmetical calculation and geometric operations easily. This need was felt especially in the military field, where the technology of firearms called for increasingly precise mathematical knowledge. 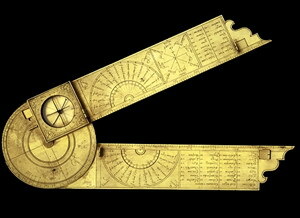 … The geometric and military compass of Galileo belonged to this class of instruments. [T]he Accademia Delia was founded in Padua to provide mathematical instruction for young noblemen training for a military career. Imagine how much of our mind will be released when we don’t have to devote so much of it to devising evil. Imagine when we are freed to think up ways to worship Jesus, or ways to praise Him, or anything else, than to creating military items that maim and kill and destroy. Jesus will dissolve the earth in a fervent heat. When He creates a new earth, there will never be a cannonball to dig up. There will never be any implements of war found anywhere, like arrowheads or bullet casings or swords. Forgers of instruments of bronze and iron will be making plowshares and pruning hooks. Won’t it be great when we will study war no more? Peace. Peace will reign in men’s hearts, between men and Jesus, and between men and men (and animals). Peace, shalom, war no more.